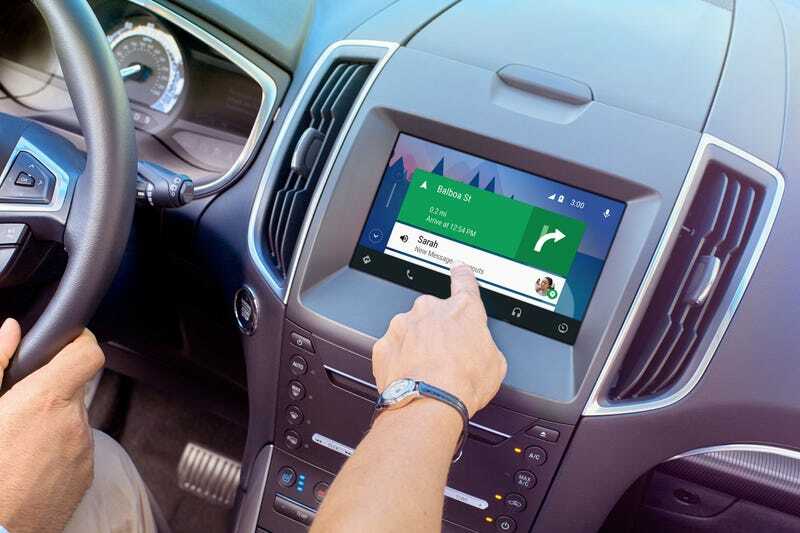 Back in December, Ford announced that all 2017 models will include both Apple CarPlay and Android Auto connectivity through its SYNC 3 infotainment system. Now, Ford has some decent news for 2016 model year owners: CarPlay and Android Auto is now available by way of a free update via Wi-Fi, a USB drive, or by visiting a dealership. The move is a leap forward for Ford, which said in a press release Friday that it’s the first time the automaker has offered an over-the-air update via Wi-Fi. Vehicles that have Wi-Fi and automatic system updates enabled within the Sync 3 system will automatically receive the update, Ford says. For CarPlay, users will still also need to upgrade their vehicle’s USB hub to make this work (which will also incur a dealer visit and a cost), but for those on Android, all that’s required is a simple software installation. The USB install method is also faster, but the Wi-Fi update option is the start of the company’s efforts to really increase its OTA update program, which will be used for security improvements as well as infotainment bumps. As we noted at the time of Ford’s decision to hire Blackberry employees, CarPlay and Android Auto are a superior choice, as most infotainment systems are junk. So, congrats 2016 model year Ford owners, you’ll have better options now.